See bonus track details below. See the Albums Page for CDs of the other four albums originally released on United Artists. A Truly Great Live Album From 1969, Plus! Somehow, I never reviewed this album, even though I have been recommending it for years. Today, I will correct that oversight. First, this CD contains the live Sunday Concert album, from 1969, and it also includes five studio cuts that were never released on any other album (either LP or CD). It'a actually a rather odd juxtaposition, and turns listening into two experiences; 11 songs performed live at Massey Hall in March, 1969, and the studio cuts which are mastered at a much higher level. So, listening, it's like 2 albums: an LP (11 tracks), and what we might call an EP of studio recordings. I don't mention this as a criticism; it's just an observation about how I react when I listen to it. It's one of a handful of CDs I listen to when I travel long distances. 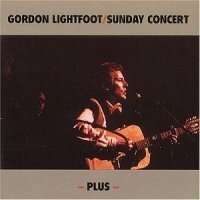 The live album is really a gem: Lightfoot at his 60s peak, performing a few of his best known songs, and the five songs that he never recorded in the studio. If Lightfoot hadn't released this live album, we'd never have heard these wonderful songs. Of the five "new" songs, the pièce de résistance is Ballad of Yarmouth Castle; Lightfoot's first true shipwreck song. Since this album was early and not widely circulated - it was the final album of his United Artists contract, and publicity was probably not the best - most Lightfoot fans (and casual listeners) know only his "big" song, Wreck of the Edmund Fitzgerald. Yarmouth Castle proves that writing shipwreck songs is not a one-time thing for Lightfoot, and that he is a master at it. Like Wreck, Yarmouth Castle was based on a magazine article; in this case an article in Life Magazine. And, as with "Wreck", Lightfoot pulled a few facts and phrases from the news story and wove an incredible song around it. For many people, this album is worth its weight in gold for just this one song, and there are a few people who actually think Yarmouth Castle is the better song. I don't agree, but those are the types of arguments we all enjoy. The other four songs never recorded in the studio are In A Windowpane, The Lost Children, Leaves of Grass and Apology; not a clunker in the bunch. It's truly amazing how many good songs Lightfoot penned in those years. Two of them (The Lost Children and Leaves of Grass) are protest songs, written in his typical gentle, understated manner. In a Windowpane is another of those songs that really gets under your skin; Apology is almost a spiritual; really quite different from most of his songs, but no weaker because of it. These five songs will really amaze you. Of the seven songs other songs (two are performed in a medley), the standout track is Canadian Railroad Trilogy. This is probably the best recording of one of the greatest songs ever written. This is another track that justifies buying this CD, even if you never play another song from it. The arrangement is amazing, with Red Shea turning in one of his extraordinary performances, alongside the newly hired Rick Haynes on bass. This is a song I never tire of, and this is a recording that showcases it beautifully. I take nothing away from the other songs, but this one is my favorite Lightfoot song, and time stops when I listen to this recording of it. The bonus studio recordings are just icing on the cake. Two of them are standouts: Lightfoot's cover of the Bob Dylan song, Just Like Tom Thumb's Blues, and his own Spin, Spin. Both were on 45s, but never on albums before this. They make the CD a "must buy", if nothing else does. The alternate take of I'll Be Alright is pleasant, and Movin' is ... well, we probably didn't need two takes of that one! This CD is from Bear Family Records in Germany. I buy it directly from them, and strive to sell them at the best price on the web. Scroll to the top of this page to listen to clips of all the songs.